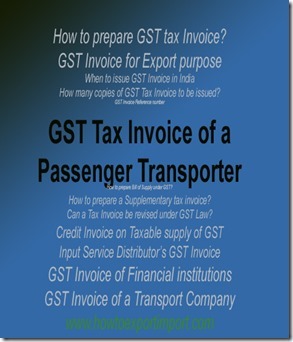 How to prepare a GST Tax Invoice by a Passenger Transporter? What are the contents of Tax Invoice of Passenger Transporter? Where the supplier of taxable service is supplying passenger transportation service, a tax invoice shall include ticket in any form, by whatever name called, and whether or not containing the address of the recipient of service but containing other information as prescribed under rule 1. 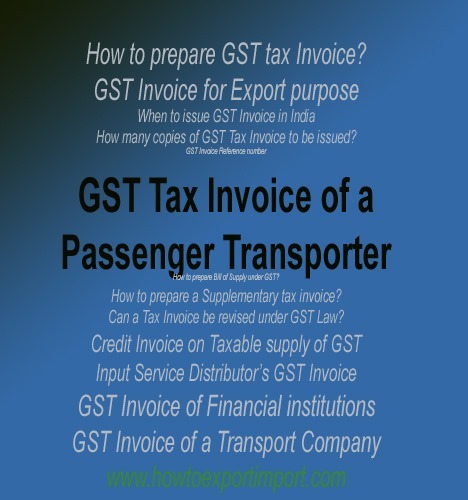 The above post explains about tips on how to prepare GST Tax Invoice by a passenger transporter. Share below your comments about guidelines to prepare GST Tax Invoice by a passenger transport company. How many copies of GST Tax Invoice to be issued? How to prepare Bill of Supply under GST? How to prepare a Supplementary tax invoice? aditya pal: On 17 August 2017 I am service provider of car taxi. I have query related to toll tax. please tell me whether GST levy on inclusive of toll tax or exclusive of toll tax. and please mentioned your by support of provision, section or rules.